Textron’s (NYSE: TXT) Bell Helicopter subsidiary has received a four-year, $439.5M contract modification to build 25 lot 16 AH-1Z twin-engine attack helicopters for the U.S. Navy. 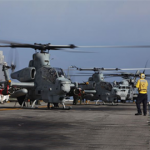 Bell Helicopter will also provide 25 stores control units as part of the modification, which exercises an option under a previously awarded fixed-price-incentive contract, the Department of Defense said Friday. Work will take place in Texas through January 2022. In August 2018, the Navy awarded a $509.7M modification for the contractor to manufacture and deliver 29 AH-1Zs in support of the U.S. Marine Corps’ H-1 modernization program.